Recently, Zenfolio announced its newest online venture, Photographer Central - an online directory of photographers. Available only in the US at present, this website promises to bring customers in direct contact with local photographers while making the search free and easy to use. For a yearly fee, photographers can maintain a listing for their business with a selection of photos. Potential clients search for photographers by location and specialty, in much the same way you'd look for Thai restaurants in your neighborhood on Yelp. Does it live up to its claims, and is it worth a not-unsubstantial investment of $400 per year? We took the service for a test spin from a photographer's perspective. The Photographer Central website is attractive and easy to navigate. In fact, it's really easy to navigate. If you are unsure if you would like to use the service, Photographer Central allows you to set up a free account. The free account doesn't allow you to publish any of your information, but it does act as a good example of how simple the paid account is to create. Photographer Central offers two paid account options: a single listing for $400 annually (currently priced at $300) and multiple listings for $500 (currently $400). Setting up your account is fast. The website guides you through the process by asking for your contact information, a description of your photography business, and images that you would like included in your listing. The site allows you to add numerous images to your listing, and if you already have a Zenfolio account you can easily transfer your images to the Photographer Central website. Otherwise, you can choose to upload the images yourself. Again, the upload process is simple and quick. 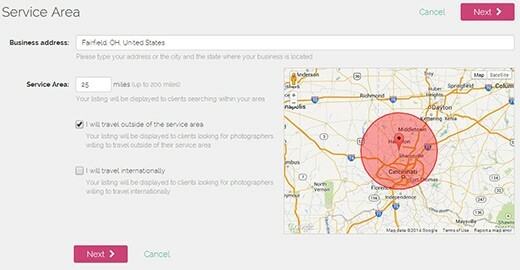 Based on the address you provided, Photographer Central also allows you to define your service area. You have the freedom to include a wide service range if you desire, and can also indicate your availability to travel outside of that area. Once you are finished adding your information just click send and your listing is published. It's as simple as that. Once published, the site reports the performance statistics of your listing. Unfortunately, I wasn't able to put this feature to the test, as the site only ever told me it was still in the process of gathering performance statistics. As I stated in the previous section, Photographer Central is an attractive website that is very easy to use, and that holds true for potential clients seeking photographers. The homepage is dominated by a search bar with fields for location and specialty. Once you have entered your parameters, a list of photographers is populated. From this list you can browse through the photographers to find one that suits your needs. Once you find photographers that interest you, you can save them to your favorites for future reference. Worth the price of admission? 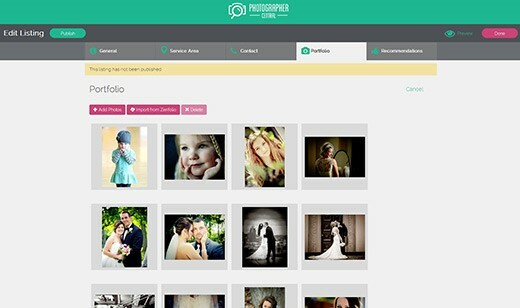 Photographer Central claims to be the most comprehensive online directory of professional photographers. And it just might be… eventually. Although the website is easy to use, there are several things that need to be considered before investing in it as a photographer. The cost of an account is not unreasonable if there is actually a return on your investment. However, when searching for local photographers on Google and Bing, Photographer Central did not show up in my search. In order for the website to draw prospective clients to your doorstep, they need to be one of the first websites listed in your search results. If not, you are advertising with a company that has little exposure. While the website looks attractive, that alone will not bring additional clients to a photographer. Another issue I found with the website was the broad range of locations it returns in search results, despite inputing a small search area. When I searched 'Fairfield, Ohio' the site said there were 103 photographers near me. I was surprised by the sheer number of photographers in my city, so I clicked to view the results. The photographers listed in the search results spanned from Illinois to Tennessee - both within a day's drive of Southwest Ohio, but well beyond what you'd reasonably consider to be 'local'. I checked to make sure I requested the correct area, but the site showed I requested photographers within a 30 mile radius. Results can be refined by narrowing search range down to 10 or zero miles, but this may not be immediately obvious to the user. And even with search area narrowed to zero miles, results may still include those photographers in neighboring states who have (presumably) set a very large travel area. This is a problem for both the consumer and the photographer. From the client standpoint, it's hard to decide what photographer to choose when the search results are so vast, and some clients may prefer the ability to choose from photographers in their immediate area, regardless of a photographer's willingness to travel from two states away. From the photographer's standpoint, it's frustrating to be grouped in with such a large number of photographers located in such an expansive area. Overall, I think Zenfolio's new venture has potential, but it will take a greater presence in Google's search results to make photographers feel that they have a good return on their investment. A $400 yearly fee for a single listing isn't chump change for a vast majority of working photographers looking to increase their sales reach. That fee would be well worth it if a listing yielded positive results, but at the moment Photographer Central doesn't appear to offer enough exposure to justify its price. Laura Hicks is a portrait photographer from Cincinnati, Ohio. She is the owner of L Imagery and a 2014 Olympus Trailblazer. You can visit her work at www.limagery.com or Laura Hicks, Olympus Trailblazer at Facebook.com. I may misremember and perhaps the cost was much reduced for the premium account... In any case, I am sure it was not an additional $300+ on top..
A couple weeks ago, looked like a nice value added service for Premium. At $300, for a limited time, the service requires more careful thought. If I am correct that the ad space was previously included with Premium, I guess they have reached some tipping point in participation to justify selling it as a stand-alone. 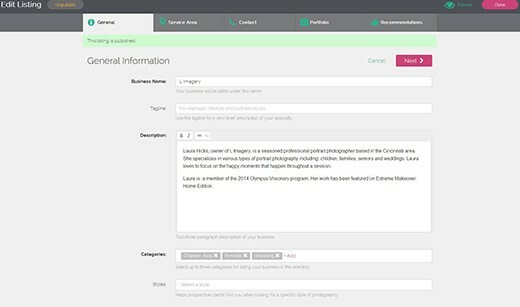 Photographer Central is included with the premium business account. Mine just renewed at $250. I had signed up with Zenfolio before the price increase. For now they honored the $250 vs $300 yearly fee. I hope Photographer Central does stay included with the premium business account. Way overpriced for this to work they will need a lot of subscribers. I have been a premium user for a few years now and really like what Zenfolio has to offer. However, as a UK user I would love to see Photobooks included. They have been promising for years. I use Zenfolio and have the premium business account. Photographer Central is currently included in the premium business account yearly fee. I would say at this point I would not have paid $400 for the Photographer Central directory. Don't know anything about Zenfolio's new PC, but I use Zenfolio for my photo hosting, and it's phenomenal. Can't recommend enough (www.alexjansenphotography.com). I would never pay for this. It is over priced, it appears to only list websites hosted on Zenfolio, and Zenfolio has never said what steps it takes to draw my potential clients to it's directory in the first place. I already know how they are marketing this site to photographers, but how are they marketing it to businesses who need photographers? It's a tough sell to ask for $400 for something that Google and word of mouth do for free. I'd rather give my money to PPA or ASMP knowing that professionals use their find a photographer directories, or I would use directories that cater to photographers in my specific field. When people need a photographer, they just go to Google and type in "photographer [city]" .. done. No one is going to think: "hmmm.. i need a photographer.. im going to use Zenfolio to find one"
This is one of those useless companies that offers no tangible products or services and demands money from the people who are actually providing the service. Agreed. When someone thinks of searching for something, they think Google, Yahoo, Bing. Not Zenfolio. There is potential though, and I hope part of that $400 fee goes towards Zenfolio making this known to professions who hire photographers, commerical and the like. This is a very useful article that brings up some good points. Well done! So did we! Typo fixed, sorry about that. I've been happily hosting my website on Zenfolio.com for the last couple of years... and they offered a sweet deal to jump on to their new endeavor. Been up for two months, and not a call. My work has a different national/international target for clientele, but I thought I'd give it a shot, aiming at Boston and NYC. I put up a site for my photo illos, and another with photo portraits Ive been doing while shooting for TF or illo gigs. Thinking that this is squarely aimed at wedding, event, and portraiture, given the local focus... but this venture by Zenfolio may be fundamentally flawed in thinking when it comes to how clients find photographers. Time will tell if they can get search engines to the individual sites, and garner paying gigs. In the meantime, it's a fun experiment.